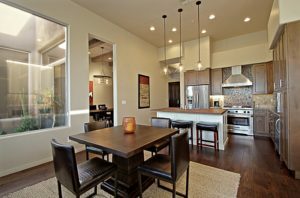 Our clients bought a second home in North Scottsdale and wanted the home to be updated with a more contemporary southwestern style. Our clients began by hiring Nora Johnson from Est Est to help them with their vision. We began with the demo of the kitchen, family room and master bathroom. After demo, we installed in the kitchen and family room new Knotty Alder cabinets, hardwood flooring, appliances and counter tops. In the master bathroom we added a free-standing tub along with a beautiful stone-tiled shower, counter tops and cabinets. Highlights of the project were the black walnut butcher-block island and the metallic brown tile around the fireplace. Our happy clients now have completed phase 3 on their home. The first phase of their remodel was the kitchen, family room and master bathroom. In 2016, we added barn doors to the office along with a few other design details. Now in 2017, we were asked to remodel the guest bathroom, add some curb appeal to the front, and to build a new walk deck at the back of the home. It has been fun watching the remodel projects slowly transforms their house into the ideal vacation home.